It only seems 5 pop minutes ago that Liam Payne, Louis Tomlinson, Niall Horan, Harry Styles and Zayn Malik were in Australia, however the One Direction boys are preparing to release their next new single Live While We’re Young.. ! The biggest boy band in the world (right now) have released the video to their already hugely popular brand new single due out officially on the 30th September, which is a pop/ light rock combo track mixed with the boys smooth harmonies and sings about living for the moment. Well Harry is certainly is doing that..! 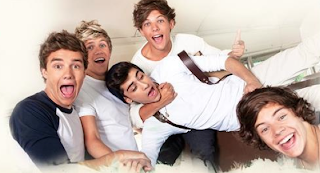 The Savan Kotecha, Rami Yacoub & Carl Falk written track continues the 1D unmistakeably sound this time with a dance edge and is the lead track of their forthcoming sophomore album due for release in November 2012. As well as reuniting with the likes of Rami Yacoub & Carl Falk and Savan Kotecha (One Thing & What Makes You Beautiful), Ed Sheeran and McFly’s Tom Fletcher, the album features input from Dr Luke (Katy Perry Teenage Dream, Taio Cruz Dynamite), Shellback (Maroon 5 Moves Like Jagger) and Toby Gad (Beyonce If I Were A Boy). The album by pre-sales alone is sure to be another huge smash hit from a truly international pop phenomenon. Well for now..!